Okay, so it's not new, I've had my set of kitchen table and chairs for years but I gave it the most fabulous makeover. Every time I look at it, I'm filled with pride. Once again, I've proven to myself that I can make anything old look new, as long as it's structure is solid. It's not perfect, I'm not professional by any means but I love to refinish furniture. I knew I wanted the end result to have a contemporary look so I decided to go for a dark finish. A Jacobean to replace the pine and charcoal grey to replace the white. In this post, I'll tell you what I did to bring my vision to life. If there's something I missed, leave me a comment. 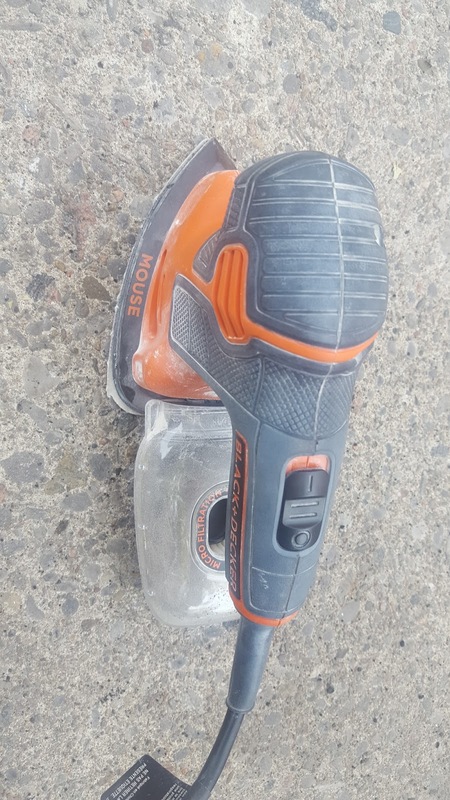 I have the Black & Decker Mouse Detail Sander ($50 or less everywhere). Every DIY'er should have one. I love it! Beautiful finish. It was one sale at Canadian Tire but I would have paid regular price. 4 cans Miniwax: Penetrates, Stains Seals 236 ml. 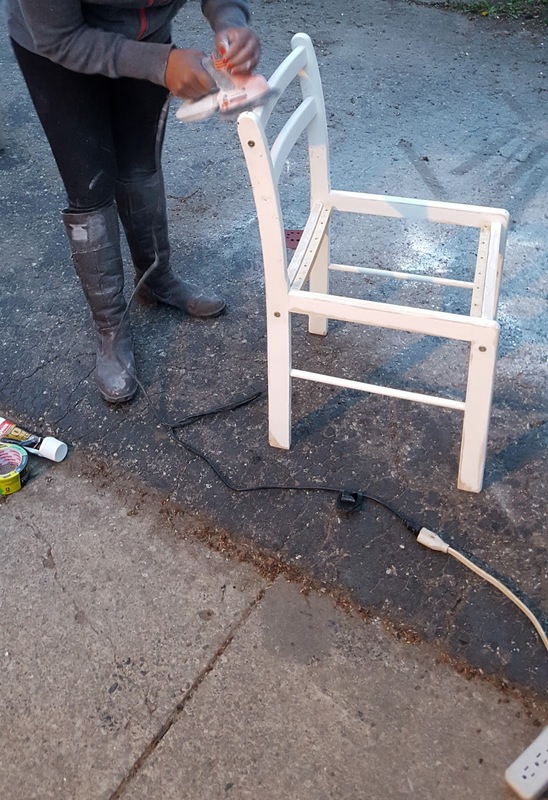 I pulled all my supplies together and took the chairs outside. I removed the slats of the seats from the chairs using a screwdriver. 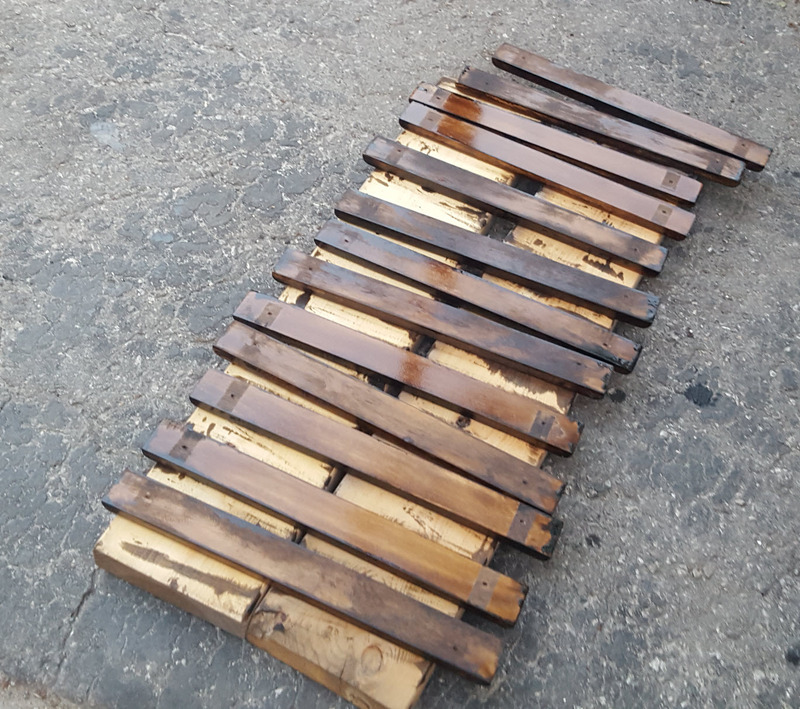 I created a stand for the slats using two old pieces of plywood. I sanded off the finish of the slats, about 10 per chair. Then I applied one coat of Jacobean Miniwax to the bottom side the slats, and let them dry completely. Then I finished the other side and left them out to air dry again. 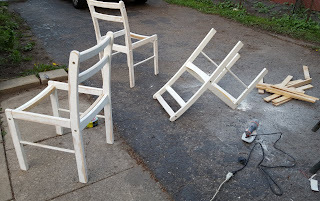 Next, I sanded the frames of the chairs, starting with the 80 grade sandpaper. I gradually moved on to 220, the fine grade, to finish each chair off to a smooth finish. My favourite part. 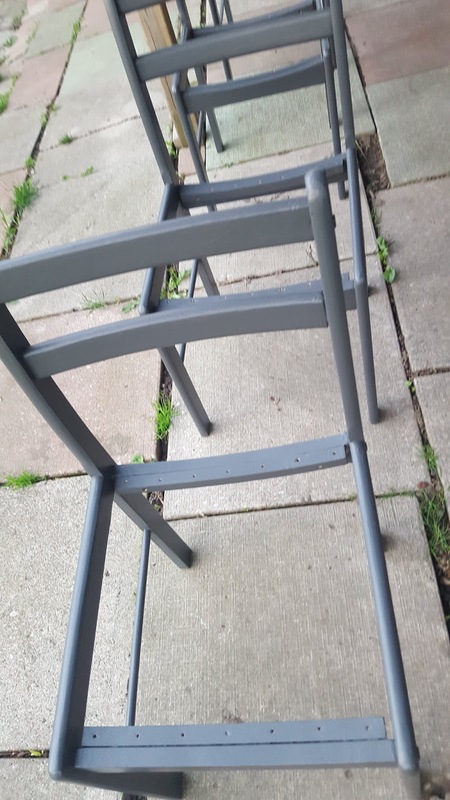 Time to paint the chairs. Took about three coats of the latex to not only cover the chair frames but to also make hard for my family to take the paint off later. 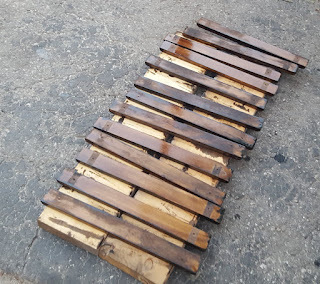 Next step was to finish off the slats using the polyurethane. I had to move fast..."fast-drying" on the label is not a joke. As you can see, I moved the slats from the ground to a table...my back was killing me bending down to the ground. Another lesson learned. 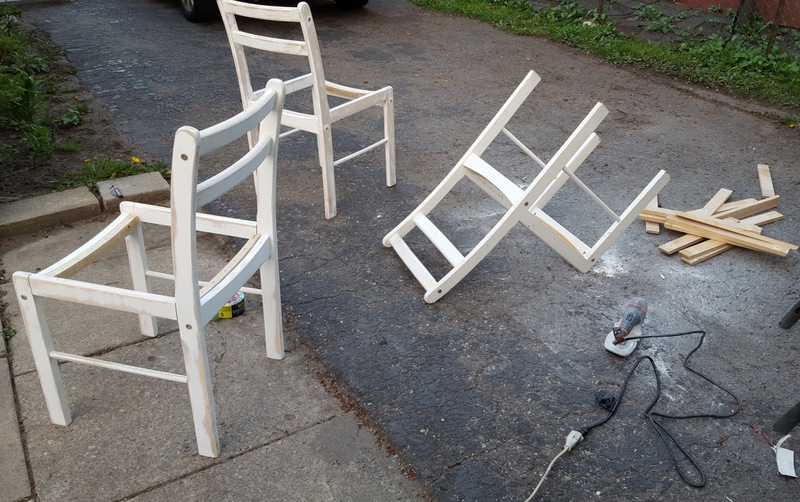 The final step for the chairs was to put the slats for the seats back on. Once the chairs were back together, I started to see my vision come to life. So satisfying. Two weeks later, I moved on to the table. 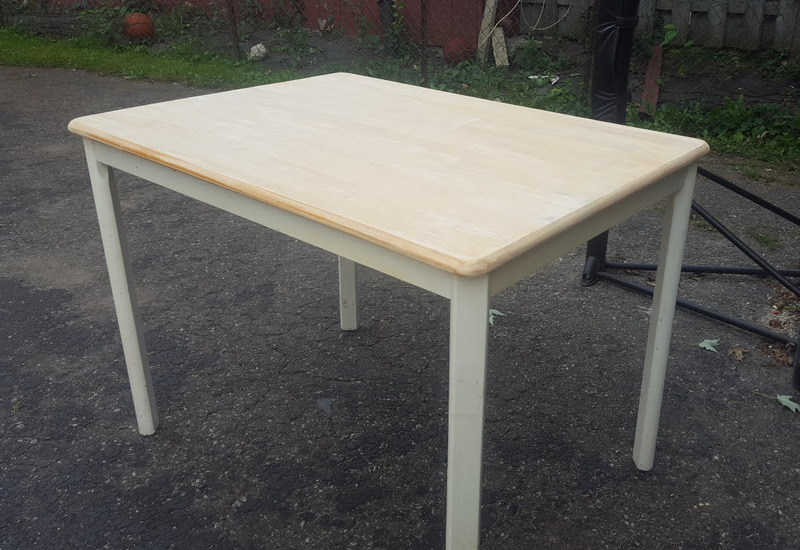 I sanded the table top, frame, and legs first starting with 80 grade sandpaper to 220 leaving the table with a smooth finish. 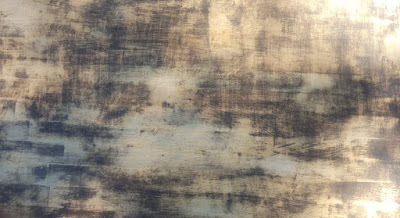 Next, I wiped down the table and legs with a very damp cloth and let it air dry for about an hour. ...I turned lemons in to lemonade. I sanded off the goopie finish. The table top still had a few spots that were stained and waxy. 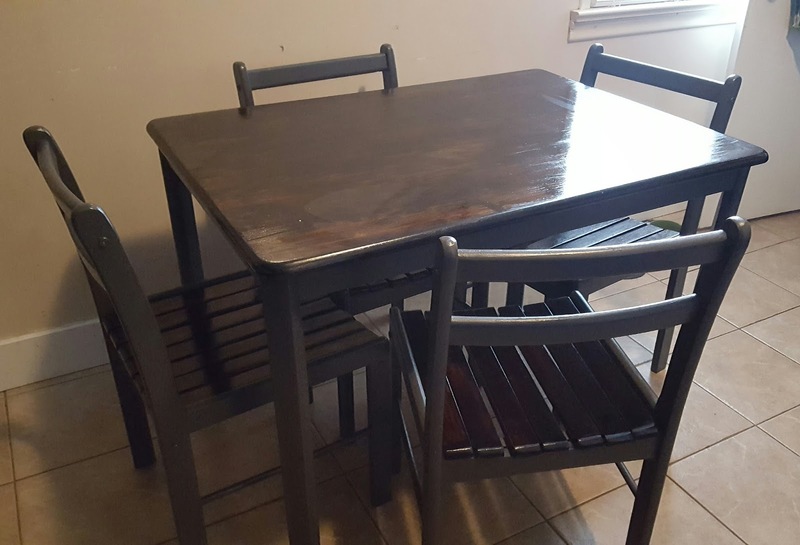 But even though it wasn't the smooth finish I wanted, I quickly decided my new kitchen table was going to be a little more rustic looking. I bought two new cans of Miniwax, in Jacobean and Eboby, and a couple more paint brushes. Another lesson learned, only use fresh cans of 3-in-one finish. 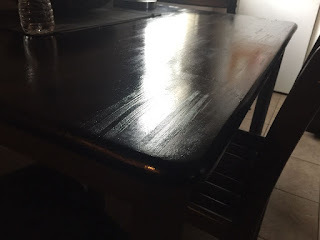 I applied about 2 full coats and a few extra touch ups to the table top and wow! Hate to brag, but it was beautiful before it dried. After letting the table top dry completely, I painted the frame and the legs with the charcoal grey latex paint. 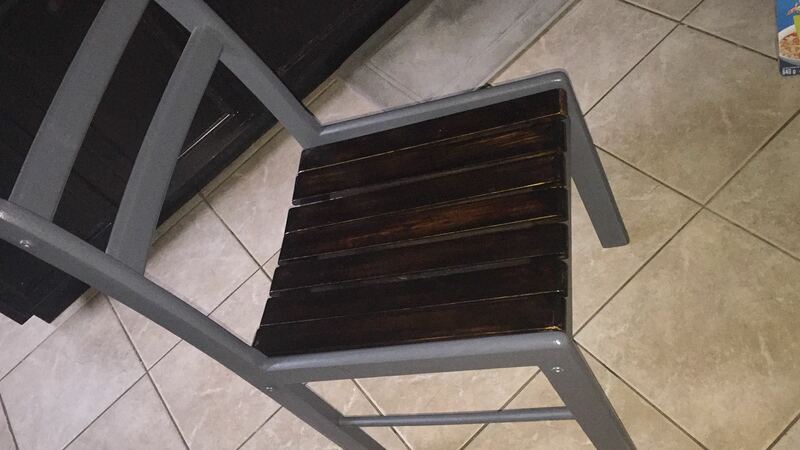 Three coats of paint as I did for the chairs. Then I waited patiently (not) for it the table to dry. Voila! My new table and chairs looks fabulous in my kitchen...as I drop the mic. Let me know what you think or if you need more info!